Editor's Note: This article was originally published in March 2016. Some details about the individuals discussed have changed since then. The role of women in philanthropy is rising in other ways, too. More self-made women are emerging with their own resources for giving, which reflects the rising economic fortunes of women—a trend likely to accelerate in coming years. At the same time, more women leaders are reaching the pinnacle of the foundation world and now helm some of the biggest grantmaking operations in the U.S. Women are also taking the lead in building donor networks and donor-advised funds, which play a fast-growing role in tapping new sources of funding and aggregating resources for different causes. One tangible result of this leadership shift in philanthropy has been more attention and more money for gender equity and women’s empowerment issues in recent years. Given all that’s happening, we created a new section of Inside Philanthropy last year devoted entirely to covering developments related to women and girls. That work has brought many new women leaders to our attention. So here, we present a greatly expanded list of the most powerful women in philanthropy. In addition to featuring many individual mega-donors, we look at top leaders of both private and corporate foundations and explore women who are making an impact by catalyzing giving, through funding intermediaries or other efforts. To make the list, a person needs to have influence over how significant philanthropic resources are being deployed. Those resources may derive from a family fortune, a foundation endowment, or from many smaller funders working together through a donor network or a community of funders. We focus on raw giving capacity because it’s relatively easy to see and measure, whereas impact is far harder to assess. Thus, a list like this will inevitably fail to spotlight some people who are actively driving change, while perhaps assigning too much weight to people who simply control a lot of money. That said, a few women have made the list mainly because of their influence on the sector. Which leads us to a broader caveat about this list: Don’t take it too seriously. We do not see this list as definitive, but as evolving, with important women continually crossing our radar. Our goal here is to offer a snapshot of the many impressive women we’re watching in the upper reaches of the philanthrosphere, while recognizing that judgments on these matters are subjective. Many readers will think of additional people who should be on this list, or question why particular women made the cut. One important point to note is that we haven’t included any women whose philanthropic activities are mainly focused locally or regionally. With those thoughts in mind, let’s dig into the list, which we’ve organized into a few categories that capture the diverse roles that high-powered women now play in philanthropy. Click on the links along the way to see more IP coverage of the individuals and organizations discussed. The great wealth boom of the past few decades is now fueling a super-charged era of big philanthropy, with many new, deep-pocketed donors emerging with ambitious plans. Women are at the forefront of this trend, often as spouses playing a hands-on role in family philanthropy that has included scaling up some of the largest foundations created in recent years. Along with her hedge funder husband Bill Ackman, Karen Ackman oversees the Pershing Square Foundation, one of the more sophisticated funding operations to emerge from the finance world recently. With an eye on catalyzing systemic change, it’s been giving big for human rights, immigrant college students, criminal justice reform, global development, and more. A landscape architect, Karen sits on the board of New York’s High Line public park, which Ackman money helped build; and Human Rights Watch, which has received major gifts from the couple. For many years, the foundation that Paul Allen created with his sister, Jody, was locally focused in the Pacific Northwest, with Jody doing much of the heavy lifting to build a grantmaking operation. Lately, though, Allen philanthropy has expanded into new areas, including global health, African wildlife and protecting oceans. Even bigger things surely lie ahead, since Paul Allen is a Giving Pledge signatory worth $17 billion. While it’s hard to know Jody’s current role in moving increasing amounts of money, she’s been a pivotal figure in his philanthropy so far. Laura Arnold works alongside her husband John, a retired hedge fund billionaire, to lead a Houston-based foundation that addresses America’s “most pressing and persistent challenges using evidence-based, multidisciplinary approaches.” Their ambitious agenda in pursuit of “transformational change” includes K-12 education, criminal justice, scientific integrity, and more. The foundation has given nearly a half-billion dollars in the past five years. Laura, a Yale-trained lawyer, has often taken the lead on the foundation’s criminal justice work, helping to orchestrate a groundbreaking left-right coalition last year to advance reform proposals in Washington, among other things. With a net worth of around $20 billion, Steve and Connie Ballmer recently emerged as mega-donors, with Connie the nonprofit veteran in the couple. She was a co-founder of Partners for Our Children, a nonprofit in Washington State that is focused on making the child welfare system more effective. The Ballmers have yet to roll out a foundation or a public strategy for their giving, but they’ve been making some big gifts, most recently kicking in $50 million for a new funders collaborative that will channel at least a billion dollars to high-performing nonprofits that serve low-income youth. The NoVo Foundation, which Buffett leads with her husband, Peter Buffett, has been awash in vast new wealth in recent years thanks to annual gifts of Berkshire Hathaway stock from Warren Buffett. Big resources have fueled the ambitions of a foundation that has long operated on the cutting edge in several areas, most notably empowering women and girls. Along with NoVo’s Executive Director Pamela Shifman, Jennifer Buffett is keenly focused on creating systemic change and supporting grantees to forge ahead in unconventional ways. Though she keeps a low profile, Susan Buffett—Warren’s daughter—is the most powerful woman in U.S. philanthropy not named Melinda. The Susan Thompson Buffett Foundation, which Susie Buffett chairs, is the biggest private backer of reproductive health work worldwide. In fact, STBF is one of the top U.S. grantmakers overall, not far behind Ford, giving away over $450 million in 2013. But Buffett also chairs two other foundations: the Sherwood Foundation, which gave out over $101 million dollars in 2014; and the Buffett Early Childhood Fund, which gave out over $18 million in 2013. Almost nobody else in U.S. philanthropy controls resources on this scale. Chan and her husband Mark Zuckerberg recently committed to the mammoth task of using 99 percent of their Facebook stock to make the world a better place. The tempo of the couple’s grantmaking and social investments has sharply risen in recent years, with education and healthcare as their top causes. Get ready for much bigger things ahead, and for Priscilla Chan—whom we’ve written about here—to emerge as among the most important figures in U.S. philanthropy. Alex is the wife of the controversial hedge funder Steve Cohen, who commands one of the largest fortunes in finance. The Cohens have been stepping up their role as active mega-donors in the New York area, focusing mainly on healthcare and education, with the arts as another major interest. All signs point to continued increases. While the couple is quite private, Alex is a key figure in their giving, with a backstory that helps explain why: She grew up in a low-income New York neighborhood. Signatories of the Giving Pledge, Ray and Barbara Dalio have ramped up their giving substantially, moving $115 million through their foundation in 2014. The Dalio Foundation is a lean shop, and Barbara plays a key role in its giving, particularly for child-focused work. The couple has supported a lot of that through charter schools like Achievement First and the Harlem Children’s Zone. But Dalio giving ranges widely, including grants to environmental and global causes, fueled by a $15 billion hedge fund fortune. Susan Dell is another example of a woman has who has played a central leadership role in family mega-giving while her husband has been running a major company. The Michael and Susan Dell Foundation, which has given over $1 billion in grants so far, has been strongly shaped by Susan, who has served as board chair. The foundation describes her as the “driving force” behind its “health and education initiatives to positively impact the lives of urban children around the world.” The Dells control a fortune of some $20 billion, so this story will be unfolding for many years to come. Gates has been a power player for years, but lately, she seems to be forging a separate path for her philanthropy that is more focused on women, leading the foundation to engage in more women-empowerment funding worldwide. We’re fascinated by what might lie ahead, especially since the Gateses have still not touched the bulk of their fortune, holding over $75 billion in private investments. 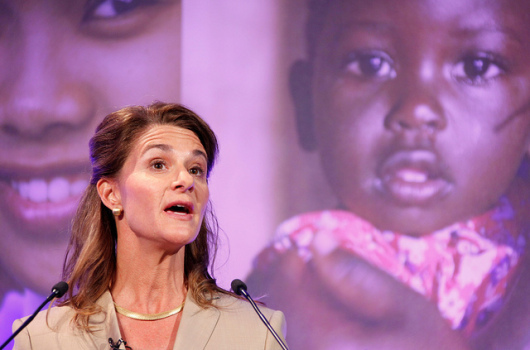 The Gates Foundation’s new exploration of U.S. poverty offers even more intriguing clues about the ultimate legacy that Melinda Gates may leave. Yet another Giving Pledge signatory moving big money, Lyda Hill is best known for her philanthropy in the areas of science and medicine. She has a particular focus on breast cancer research and treatment, and in 2015, she donated $25 million to this area. But she has other interests, too, and last year, we wrote about the Lyda Hill Foundation’s embrace of marine protection. Meanwhile, she’s a major local player, with a big philanthropic footprint in Texas. While Laurene Powell Jobs commands a fortune of $17 billion, it’s hard to say how much money she gives or invests for social good, since she operates through the opaque Emerson Collective, an LLC. But last year, she made her biggest public splash yet as a philanthropist with XQ: The Super School Project, a $50 million initiative that seeks to reinvent high schools. Powell Jobs also has longstanding interests in environmental work, serving on the board of Conservation International, and has advocated causes including immigration reform. As the wife of eBay founder Pierre Omidyar, Pam Omidyar has long been a major player in philanthropy. Since 2000, Pam has founded or co-founded all five of the organizations that she and her husband have created to carry out their philanthropic work. Most notably, Pam has taken the lead on humanitarian issues as the founder and "guiding visionary" of Humanity United, which fights conflict and injustice in some of the most troubled places in the world —South Sudan, for example. Picower zealously ducks the spotlight, but it deserves to find her. The JPB Foundation, which she runs with a lean staff, has assets of over $3 billion and gave out nearly $120 million in 2014. Who knew, right? Well, actually, Picower—the widow of the late financier Jeffrey Picower—has become widely known in top New York philanthropy circles as she’s taken a hands-on approach to scaling up JPB, calling on many veteran funders for advice along the way. JPB may operate well below the radar, but if you work in any of its program areas—like the environment—you know what a big deal JPB has become in a very short time. The billionaire widow of a natural gas tycoon, Schusterman’s power within philanthropy takes two forms. She’s the founder and co-chair of the Charles and Lynn Schusterman Family Foundation, which has over $2 billion in assets and a major footprint in national education grantmaking, among other things. But just as importantly, she’s a central figure in Jewish philanthropy. Schusterman money reaches a wide array of Jewish groups, and it often seems like she’s everywhere in the Jewish nonprofit world, pulling people together and making things happen. As the driving force behind the Simons Foundation, which she co-founded in 1994 with her husband, hedge funder Jim Simons, Marilyn Simons is at the forefront of science funding. Under her leadership, the foundation has emerged as one of the largest private supporters of basic science in the United States. It’s also backed groundbreaking autism research, through the Simons Foundation Autism Research Initiative. The foundation paid out $230 million in grants in 2014, and with a $15 billion fortune waiting in the wings, we’re betting that bigger things are yet to come. The wife of Facebook co-founder Dustin Moskovitz, Tuna is the architect of the young couple’s foundation, Good Ventures, one of the more thoughtful philanthropic operations established in recent years. Good Ventures has lately moved seriously big money for global health and development, including a $25 million grant to GiveDirectly, an NGO that, true to its name, gives money directly to poor people in developing nations. With a $10 billion fortune to spend down, this foundation may eventually rank among the top U.S. grantmakers—and Tuna will likely be a key player in the philanthrosphere for many years to come. Along with her husband Barry Diller, the fashion leader Furstenberg has broken new ground with giving to reshape urban landscapes. The Diller-von Furstenberg Family Foundation was instrumental in creating the High Line, putting up $35 million to create a park that transformed West Chelsea in Manhattan and now ranks as one of the city’s leading tourist destinations. The couple has since committed $130 million to create an island park nearby, on the Hudson River. Foundation funding also flows for a range of other causes, including education, human rights, arts, health and the environment. Additionally, Furstenberg has fostered leadership for women’s causes through her giving. It’s hard to know which woman from the Walton family to put on this list, and we were tempted to choose Carrie Walton Penner—the third-generation family member who helps chart the Waltons’ influential education giving. But Alice Walton, who is worth $40 billion, is indisputably a major power player in U.S. philanthropy. She’s long been centrally involved in the Walton Family Foundation, one of the largest grantmakers in the U.S. Even more notably, Alice Walton has created a major new art museum—Crystal Bridges - Museum of American Art. Our hunch is that even bigger things are likely to come with Walton’s arts philanthropy. White has given $350 million since 2004 through a foundation named for her late financier husband and designed to eventually sunset. She’s made record-breaking gifts to a range of New York institutions, but neuroscience is another major focus and White’s interests also extend to the arts and humanities, human rights, and Jewish causes. With some $600 million still on hand, look for the pace of giving to pick up in coming years. In case you haven’t noticed, women now run a number of the largest foundations in the United States. In fact, women have had more success in claiming top leadership spots within the foundation world than any other powerful U.S. sector. One 2014 survey of foundations found that over half had women CEOs. Among grantmakers with $1 billion or more in assets, women accounted for 28 percent of CEOs. An oncologist who once led product development at Genetech and was chancellor of UCSF, Desmond-Hellmann is leading the Gates Foundation at an interesting moment. It’s gone down fresh avenues with its education work, made real headway on some of its key global goals, and opened a big new area of exploration with an initiative on U.S. poverty. Under her watch, the foundation has also been pushing harder on women’s empowerment. All of this is a reminder that the Gates Foundation—which Desmond-Hellmann calls a “learning organization”—is anything but static. Patricia Harris, the CEO of Bloomberg Philanthropies, has worked with Mike Bloomberg forever and has been affectionately referred to as his “velvet hammer.” Now, she’s helping guide one of the largest philanthropic operations in the U.S., one that distributed over a half-billion dollars last year. To move that kind of big money, Harris began an organizational expansion of the foundation when she took over in 2010, building an outfit that has gone beyond Bloomberg’s core interests of global public health and climate change to tackle new issues, like overfishing. The David and Lucile Packard Foundation is a giant, giving out around $300 million a year. And it's a giant that has been strongly shaped by Carol Larson, who was formerly a corporate lawyer. She has been with the foundation since 1995 and its president since 2004. Early in Larson’s leadership, Packard made a massive bet on curbing climate change—an issue that has only become more urgent since then. Larson has been one of the foremost advocates lately for more foundation attention to this area. But Packard money also looms large in other areas, such as women’s reproductive health and children’s well-being. Lavizzo-Mourey has one of the most ambitious visions of any foundation leader today, focusing RWJF on creating a “culture of health” in the United States. RWJF, a $10 billion mothership for healthcare philanthropy, is pulling every lever it can to advance this goal—with grantmaking to fully realize the promise of universal coverage, improve the efficiency and quality of the U.S. healthcare system, look upstream to address the underlying causes of poor health, and pursue a wide range of efforts to help Americans eat better, move more, and lead healthier lives. Want to see how a leader with vision can fundamentally reinvent a foundation? Check out what Clara Miller has done as president of Heron. A pioneer in impact investing at the Nonprofit Finance Fund, which she founded and ran from 1984 through 2010, Miller led Heron on an ambitious quest to harness 100 percent of its assets to advance the foundation’s mission of fighting poverty. Along the way, she’s raised the bar for the rest of the foundation world. Tabron is in charge of the largest foundation devoted to children in the country, with over $8 billion in assets. Her backstory of growing up in an African-American family of 10 children in inner-city Detroit is remarkably aligned with the foundation’s mission of helping kids and families succeed in some of the poorest corners of the U.S. Among other things, under Tabron’s leadership at Kellogg, the foundation has doubled down on its prescient—and bold—racial equity work. Osberg has been a central figure in scaling up the social entrepreneurship movement, tapping the fortune of eBay billionaire Jeff Skoll since 2001 to build a far-flung global network of individuals who "both take direct action and seek to transform the existing systems." She's the founder of the Skoll World Forum on Social Entrepreneurship, and recently published Getting Beyond Better: How Social Entrepreneurship Works, with Roger Martin. A former top leader in academia, Rodin has put the idea of “resilience” at the center of the Rockefeller Foundation’s work in recent years, helping communities worldwide prepare for and recover from major environmental and man-made shocks. She’s even written a book on the subject, and is an important player in bringing these ideas to New York City. Under her tenure, Rockefeller has also stuck with such signature issues as improving agriculture in poor countries. As well, with its economic inclusion work, Rockefeller is among those funders grappling with inequality. Stasch is the latest woman tapped to lead a top U.S. foundation. She officially took MacArthur’s helm last year after over a decade as a top exec there, and has moved with bold decisiveness to streamline the foundation and focus its resources on some of the biggest challenges of our time, including climate change and mass incarceration. Stayed tuned, because Stasch is also aiming to heighten MacArthur’s leadership roles on impact investing and nuclear security, and she has promised a major new initiative in an unnamed area. The once-sleepy world of corporate philanthropy has been sizzling lately, as these funders think bigger and become more creative. Women leaders have been an important part of this surge. Often, these women don’t just command serious grantmaking budgets, they’re also deploying the full range of a company’s assets to effect social change. Salesforce is one of the most philanthropically innovative companies in America, with giving—of money, product, and employee time—baked into its mission. DiBianca has helped lead this bold experiment from the start, and has emerged lately as an important leader pushing tech firms, and especially startups, to integrate philanthropy into their operations. She’s also shown just how closely corporate funders can work with local public schools. A company lifer, Deb Elam has led the GE Foundation since 2013, doubling up with her other role as chief diversity officer for GE, a title she has held since 2002. The GE Foundation is one of the top 10 corporate funders, and focuses on health, education, and disaster relief. Under Elam’s leadership, it has recently bolstered women in STEM and manufacturing. This is a good way to make a positive impact not just on the economy, but on women’s empowerment. Overseas, the foundation is working another distinctive niche with its funding to make surgery safer. Before taking the helm of the PNC Foundation, McCradywas the architect of the firm’s ambitious philanthropic initiative to boost early childhood education, Grow Up Great, which launched in 2004. Now, of course, the idea that early childhood education is a key to helping kids overcome poverty and other barriers is widely discussed by everyone from President Obama downward. Still, PNC remains the most visible corporate funder in this important space, with McCrady out front. We noted a while back that the Walmart Foundation has been getting a lot more interesting. One reason for that is McLaughlin, who previously directed McKinsey’s Social Innovation Practice, and has led the foundation since October of 2013 while also serving as Walmart’s chief sustainability officer. A signature of McLaughlin’s tenure is advancing Walmart’s ambitious global agenda for women’s economic empowerment. That effort, launched in 2011, involved traditional grantmaking along with steps by the company to boost women at every stage of its business, from sourcing to transporting to retail. Since 2009, Sullivan has led one of the world’s largest corporate funders and a vast employee volunteer operation that contributed some 2 million hours of service in a recent year. Sullivan is passionate about getting youth educated and into the job market, which is a signature focus of the foundation’s work. It’s made more than $190 million in donations to leadership and service nonprofits for young people since 2004. The foundation also has an eye on energy and environmental issues, and has backed work to link that area to its career readiness efforts. Since taking over the Caterpillar Foundation in 2011, Sullivan has led an ambitious—and, at times, edgy—quest to address the “root causes” of global poverty. The once-sleepy corporate funder has thrown big money behind advocacy work, water and sanitation projects, and more. Most notably, it’s become a fierce backer of women’s empowerment, which Sullivan sees as the key to development. Sullivan seems to be everywhere in this red-hot area, whether it’s backing work on gender equity in education or a push to nurture women entrepreneurs in Africa. The capacity to write large checks is one kind of power in philanthropy. Another is the ability to organize and galvanize donors by creating networks and spurring new or more coordinated giving. Women are the superstars of this kind of collaborative philanthropy, and the importance of well-connected catalysts is growing as legions of new donors arrive on the scene, with many looking for guidance and community. Arrillaga-Andreessen wears three hats in the philanthrosphere. She’s been a cheerleader for a new brand of mass giving, redefining “philanthropist” as anyone who gives anything. She’s an important influencer in a fast-growing tech philanthropy scene in the Bay Area. And she’s a philanthropist herself, giving with her husband, the venture capitalist Marc Andreessen, and also through her involvement in the foundation of her father, a real estate billionaire. Since 2002, Berman has built one of the world’s top philanthropic service organizations, a whisperer to the wealthy that leverages the Rockefeller brand to orchestrate $200 million in giving a year in over 25 countries. With legions of new donors arriving in the philanthrosphere, the experts running intake operations like RPA have growing clout as they shape the nature and direction of emerging grantmaking. Berman and RPA also wield influence through various thought leadership projects. Case is a woman who was ahead of her time, pushing impact investing years before the idea caught fire in the philanthrosphere. The Case Foundation, which she started in 1997 with her husband AOL co-founder Steve Case, is not in the big leagues in terms of its giving capacity, but it’s played an important role in shaping debates. Case herself is a highly visible figure in the field, playing a number of leadership roles, including serving on the boards of the Harvard Business School Social Enterprise Initiative and the Stanford Center on Philanthropy and Civil Society. Say what you will about the ethical issues involved in crossing politics with philanthropy. The bottom line is that Hillary Clinton is a force field of power in both arenas, integrating them in new ways. If she wins the presidency, she’ll bring unprecedented savvy about philanthropy to that office. If she loses, look for her to transform the Clinton Foundation into an even bigger player. One point often lost on critics of that outfit is that its main liability—entwinement with a far-flung political network—also accounts for its unique ability to mobilize new resources and partnerships behind different causes. America’s biggest donor-advised fund didn’t that get way by accident, and before taking the helm in 2014, Amy Danforth played a key role in Fidelity Charitable’s remarkable recent growth. A Fidelity lifer, Danforth came over from the firm’s business side in 2008 as senior vice president and orchestrated an ambitious strategy to pull in more donors and push out more grants. Grantmaking nearly doubled in five years, to $2.1 billion in 2013, so it’s no surprise that she’s now in the top job. After Sue Desmond-Hellman at Gates, no one—man or woman—oversees a larger river of giving than Amy Danforth. Dennis has been a central figure in conservative funding circles for over two decades. She built the Philanthropy Roundtable during its formative years, and then helped found DonorsTrust and Donors Capital Fund, which runs donor-advised funds for conservative and libertarian donors; together, they moved over $100 million in a recent year. Dennis remains a board member of DonorsTrust, and also serves on several foundation boards. But her main gig is heading the Searle Freedom Trust, a leading supporter of conservative policy work. Greenfield is a relative newcomer to both donor-advised funds and philanthropy. She’s only led Vanguard Charitable since last year, and her name won’t ring a bell for most people in the philanthrosphere. But pay attention: Greenfield is driving yet another runaway train on the DAF express. Vanguard has doubled its assets since 2012. Over 12,000 people do their giving through Vanguard, and in a recent year, it gave nearly $700 million—which is more than the Ford Foundation. Since 2002, Hall has fostered a community of more than 200 progressive women donors. WDN marshals resources for a number of issues—like reproductive justice, racial equity, and economic opportunity—but the cause closest to Hall’s heart is civic equality for women. Through its Reflective Democracy Campaign, WDN has pushed for more women representation at all levels of government. Harnisch’s foundation, theHF, is combining creativity, social justice, and women's empowerment in new ways. Through its innovative grantmaking on women and media, and its latest Funny Girls grant initiative that teaches resilience and leadership through improv, theHF has accomplished much with relatively modest resources. Meanwhile, she pops up everywhere in the gender equality world—for instance, Harnisch was executive producer of The Hunting Ground, a new film about campus sexual assault. For over 15 years, Kirsch has quietly built New Profit into one of the nation’s top venture philanthropy firms. New Profit is focused on a handful of issues—including education and economic empowerment—and is crystal clear about its mission of backing visionary leaders with big ideas. Kirsch and New Profit also understand that shaping public policy is a key to effecting major changes. New Profit had $25 million in revenue in 2014, and a secret to Kirsch’s huge fundraising success is that she speaks the language of America’s financial elite, demonstrating the return on their investments in New Profit; another factor is building a powerhouse board of directors. Schwab Charitable has played a key role in ushering in the new golden age of donor-advised funds, and Laughton has been at the center of that action as its head since 2012—since then, its assets have more than doubled, topping $6 billion as of mid-2014. Schwab Charitable’s grantmaking has risen in tandem, hitting a record $1 billion in fiscal year 2015. Only the Gates Foundation and Fidelity Charitable move more money. And who is Kim Laughton? A Harvard MBA who spent years in finance before showing her skill at riding the DAF tidal wave. All roads in progressive philanthropy seem to lead to Lord, who runs NEO Philanthropy, formerly known as Public Interest Projects, and also directs the Ottinger Foundation. NEO, a low-profile funding intermediary, moves over $40 million a year and works with a who’s who of major foundations, managing projects that often focus on social justice and civic participation. But Lord and NEO’s staff also work with many family foundations and individual donors, uniting diverse funders in collaborative efforts. Younger oversees the oldest women’s funding shop, and one that is very much at the center of the action these days, as women’s empowerment issues command new attention. Younger is a leader for women’s health, safety and economic security, and most notably, was a leader of Prosperity Together, the initiative announced at the White House in November that will provide $118 million in funding for women and girls of color. After leaving a successful career in finance, Zehner zeroed in on women’s issues, and has worked to galvanize more giving in this area through Women Moving Millions, a growing network of wealthy women who’ve given at least $500 million so far for projects and programs that benefit women and girls. Zehner is also involved in a wide range of other women’s initiatives and is a philanthropist herself through a family foundation she established with her husband.